The Canadian-American actress, screenwriter, and producer of Greek descent is Antonia Eugenia Vardalos. She is professionally known as Nia Vardalos. Vardalos and Gomez filed for divorce after 25 years of marriage. 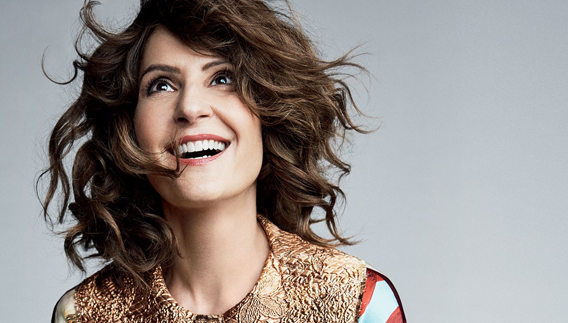 Nia Vardalos’s real name is Antonia Eugenia Vardalos. She is born on 24 September 1962 at Winnipeg, Manitoba, Canada. She was born to Doreen Christakis who was a bookkeeper and homemaker and Constantine "Gus" Vardalos who was a land developer. She belongs to American nationality. She attended St. George School and Shaftesbury High School. She attended Ryerson University. Vardalos’s height is 1.68 m and weight is 59 kg. Her hair color is dark brown and the eye color is also dark brown. Overall, she has the balanced and healthy body. In the beginning, she had many small roles in television shows such as ‘The Drew Carey Show’ and ‘Two Guys and a Girl’. For the ‘Star Wars: Return of the Jedi’, she also provided voices for the 1996 radio adaptation. She also played in the movie named ‘My Big Fat Greek Wedding’. In 2004, she was in the movie named ‘Connie and Carla’. In 2009, she features in the film named ‘I Hate Valentine’s Day’ and ‘My Life in Ruins’. In 2011, she with Tom Hanks wrote a romantic comedy film named ‘Larry Crowne’. She also joined to produce ‘The 1 Second film’. She performed The Beatles song ‘Golden Slumbers’ on the 2006 charity album ‘Unexpected Dreams – Songs from the Stars’. In 2014, she published a book named ‘Instant Mom’. In 2016, she starred and co-wrote the film named ‘My Big Fat Greek Wedding 2’. Since 2015, she and her husband Ian Gomez have co-presented ‘The Great American Baking Show’. In 2002, as a writer, she won American Screenwriters Association Award for ‘Discover Screenwriting Award’. In 2002, as an actress, she won for Independent Spirit Award for ‘Best Debut Performance’. Vardalos is married. She married to American actor Ian Gomez on September 5, 1993. She converted to Greek Orthodoxy prior to marrying her. She became a U.S. citizen in 1999. In 2008, they adopted a daughter named Ilaria. It was announced on July 3, 2018, that she filed for divorce from Gomez after 25 years of marriage. They decided to get divorced due to irreconcilable differences. Vardalos’s net worth is estimated to be $10 million. She is named after her grandmothers Eugenia and Antonia.